Bed bugs (Cimex lectularius) continue to rank as one of the most important pests for the industry. Despite the regularity with which we encounter and work with bed bugs, it’s important to remember that these pests are successful because they spread by hitchhiking on equipment and belongings associated with humans. Respecting their vagabond nature, and inspecting equipment and clothing used as part of management efforts, can help keep you from spreading bed bugs among accounts. This reminded me of a story she had shared previously about how whenever she performed bed bug work in infested structures, she always wore an old pair of shoes that had barely any tread left on the bottom. It helped her avoid having bed bugs hitching a ride on the soles of her footwear. This simple, yet important, effort shouldn’t be lost on pest management professionals. Accidentally infesting The Ohio State entomology labs with bed bugs would be a problem, but how much more of a concern would inadvertently infesting a client’s (or your own) home be? Before you leave an infested account, inspect your equipment, shoes, pant cuffs — anyplace where bed bugs could stow away. 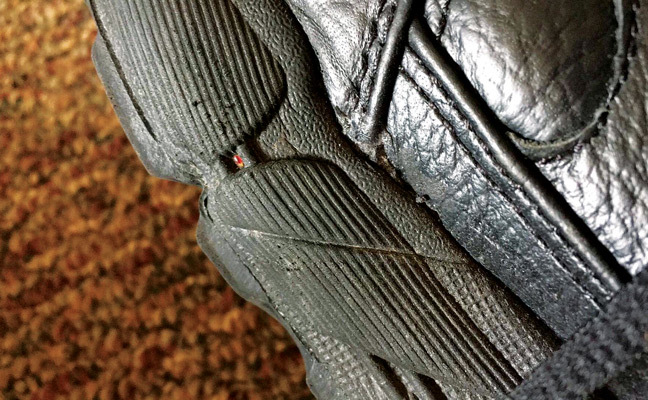 If tread-free soles don’t comply with your company’s safety protocols, consider shoe covers in addition to your careful post treatment inspection, to avoid the nightmare of introducing bed bugs to your next client.